It was billed as a clash of two John Moore-trained titans and Sunday's Group 1 Hong Kong Derby did not disappoint. Designs On Rome and Able Friend delivered the epic duel everyone had hoped for at Sha Tin racecourse, with the former emerging victorious. This is going to be an exciting field! -- Invitees for G1 Audemars Piguet Queen Elizabeth II Cup 2000m turf at Sha Tin on April 27. Fabulous field, but...these are the INVITEES, right? How many do you think will actually run? TVG has picked a good time to add Hong Kong racing, although it will being going off really late, even for this California resident. Our East Coast fans may be wondering whether to stay up...or get up early to watch. BaroqueAgain1 wrote: Fabulous field, but...these are the INVITEES, right? How many do you think will actually run? Epiphaneia and Uncoiled have already booked flights. They will leave from Japan on April 18. I'm not yet sure about the others. That's good. I would presume that the Hong Kong horses will all run, if they are ready and healthy. That leaves the South African horses and Cirrus,' who were all in Dubai for the Racing Festival. It's not too long a hop over to Hong Kong from there? BaroqueAgain1 wrote: That's good. I would presume that the Hong Kong horses will all run, if they are ready and healthy. That leaves the South African horses and Cirrus,' who were all in Dubai for the Racing Festival. It's not too long a hop over to Hong Kong from there? Mike de Kock's duo Vercingetorix(SAF) and Sanshaawes(SAF) have been confirmed for the Audemars Piguet QEII Cup. Cirrus des Aigles(FR) has been withdrawn. He will instead be headed to the Prix Ganay at Longchamp for a clash with champion Treve(FR). Epiphaneia(JPN) and Uncoiled(FR) arrived at Sha Tin on April 18. Vercingetorix(SAF) and Sanshaawes(SAF) arrived at Sha Tin on April 21. Horse No. Horse Name	Country/Region Draw No. Designs on Rome(IRE) won it. He became the third horse in history to achieve Derby - QEII Cup double in the same season, following Vengeance Of Rain(NZ) and Ambitious Dragon(NZ). Designs On Rome is a four-year-old, yet he won the Hong Kong Derby earlier this year. Does Hong Kong run their Derby as a race for four-year-olds, instead of for three-year-olds? 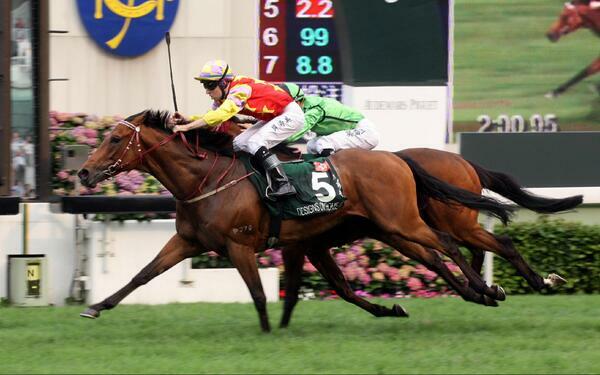 BaroqueAgain1 wrote: Designs On Rome is a four-year-old, yet he won the Hong Kong Derby earlier this year. Does Hong Kong run their Derby as a race for four-year-olds, instead of for three-year-olds? The Hong Kong Derby is for 4-year olds, since 1981. Thanks. I like that...gives youngsters more time to mature before they're thrown into the typical Derby pressure. That combined with the fact that 99% of all horses racing in Hong Kong are imported while they are in training makes it kind of hard to have a 3 y/o derby when many of their best stock are only arriving halfway or near the end of their 3 y/o seasons from Europe, Australia, etc. Horse No. Horse Name	Country / Region Draw No. Hard to go against Able Friend, although I don't love the outside draw in a mile race. He was a winner the first night I got to watch racing from Sha Tin on TVG...and he was impressive. Japan's challenger Meiner Lacrima is a son of Chief Bearhart. I'm pulling for South African star Variety Club. But this race has never been won by an overseas runner. And the home team looks strong again this year. Great win! This horse is definitely better on turf than on the tapeta. Really looking forward to his Euro campaign, & then on to the Breeders Cup Mile!